Biographical: The drag racer was killed when he skidded out of control on an oil slick. More research is needed. Biographical: He died Sunday from injuries sustained in an accident on Saturday night. Further research is needed to determine his surname (see newspaper article) and other details. Biographical: He died when his vehicle went off the end of the race track and crashed. He weighed over 300 pounds and was from Wadding Cres., Mississauga, Ontario, Canada. Biographical: Sixty feet out from the start his car made a hard move left toward the center line, then a hard right, whereupon it hit the wall. The impact resulted in the headers breaking off the engine, which was still running. This caused a fire. The car continued down the race track on fire, not stopping until well beyond the finish line. By the time the safety crew could address the fire, Dapozzo had been badly burned. He succumbed to his injuries in a Nashville, Tennessee hospital about three weeks later. He was a veteran driver of long experience, winning ten national events and two divisional titles, principally in the 1980s. 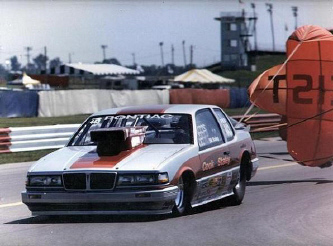 He was one of the few drivers to win national events in both Top Alcohol Dragster and Top Alcohol Funny Car. 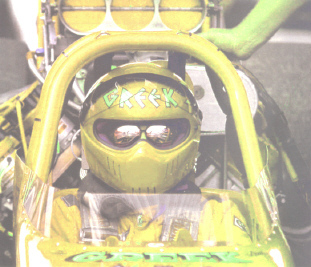 His best time in the dragster was 6.305 and 216.86 MPH. He was survived by his wife, Joann, and one child. Biographical: While making a solo test run, he lost control of his car about three-fourths of the way into the quarter mile. It veered sharply to the left, slammed into a wall, and rolled well beyond the finish line. His helmet came off when he struck the wall and he suffered severe head injuries. He was transported to Queen of the Valley Hospital in Napa where he was pronounced dead. He was a resident of Napa, California. Biographical: He suffered a heart attack in his car while returning to the pits on the return road after winning the first round of eliminations. He was rushed to Petaluma Valley Hospital where he was pronounced dead. He was a resident of Alta Loma, California. He won the Super Stock division at the 1993 Winternationals and the 1990 Winston World Finals at Pomona. Full Name: Vinston Holmes, Jr.
Biographical: He died during a private testing session on the 1/8th-mile drag strip. 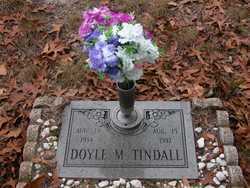 He was a resident of Fayetteville, North Carolina. He was a runner-up in Comp at the 1990 Winternationals. Full Name: Eben Thomas Johnson, Jr.
Biographical: He was killed after his car veered, hit a guard rail, and flipped. He was ejected from the vehicle. He lived in Kissimmee, Florida. Biographical: When he slammed into a guard rail, a piece of the rail punctured his windshield and struck him in the head. He lived in Concord, North Carolina. He was a loan manager by occupation. Biographical: He lost control of his jet car during an exhibition run and slammed into a concrete retaining wall. He died at the scene shortly after the crash. He had only recently bought the jet car. He was a resident of Webster, Massachusetts. Biographical: When his engine blew in the first round of eliminations, the oil coated the track and his tires. This caused the car to go out of control at a speed of 138 MPH, hit the Jersey barrier wall at least twice, rolled several times, and pinned Moeckel. 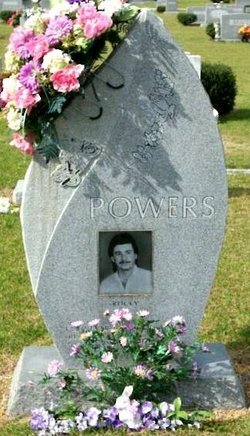 He lived in North Andover, Massachusetts, and was survived by his wife, two daughters, and two sons. His death and accident occurred two years to the day after John Tartaglia died at the same race track. In fact, Moeckel stored his race car in a trailer that had been owned by Tartaglia. Biographical: He died when his vehicle struck a guard rail after failing to stop at the end of a run. He died while being transported to Fairfax Hospital by helicopter. He was from Warrenton, Virginia, and was survived by his wife and two sons. He had been drag racing for fifteen years. 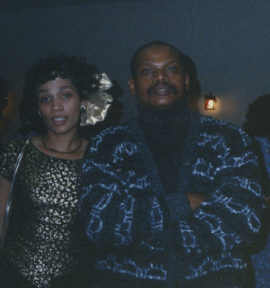 Mitchell Morton in his early mid-20s (left) and with his wife, Carolyn Lea Morton-Hall (right) a little less than a year before he died. 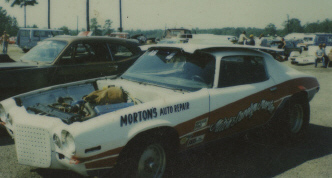 This Camaro is one of Morton's first race cars. 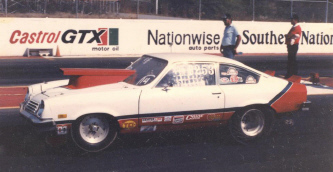 Morton won a championship at Sumerduck Dragway in 1986 with this modified Chevy Monza. This is the car Morton was racing in his fatal crash. Biographical: He was competing in a match race against Doug Foxworth. As he neared the finish timing lights, his wing strut became detached on the right side causing his car to go out of control. His car veered into the left guard rail at about 260 MPH. It became airborne with part of the car sliding on top of the guard rail. The car eventually went over the guard rail and hit a pole holding up a track video screen. Upon impact, the car broke into numerous pieces. He was pronounced dead with major head injuries shortly after his arrival at Baylor University Medical Center. He was a successful racer nationally in the 1960s before retiring in 1971. He was the first driver in NHRA history to set records in four different categories (AA/FD, A/FD, AA/D, and S/FX). 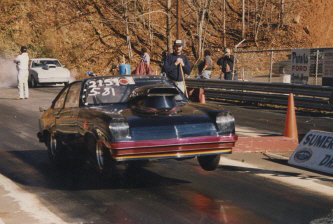 He returned to competitive drag racing in 1990. He broke the track record at the 1994 Winternationals in Pomona in T/F. His best time in the car had been a 4.78 and 286.75 MPH. Biographical: When his parachute failed to open, he lost control and his vehicle slammed into a concrete retaining wall at a speed of about 150 MPH. He died at San Pedro Peninsula Hospital. He was semi-retired from drag racing. He was a high school shop teacher and auto parts store owner from Lomita, California. Biographical: After clocking a speed of 170 MPH, his parachute failed to open properly. His chute failed to fill with air. He spun out of control, struck a guard rail at the end of the race track, and rolled over several times before coming to a stop. It was his fourth run of the day. He was pronounced dead on arrival at a hospital. He was a resident of Winnipeg and was survived by his wife and son. 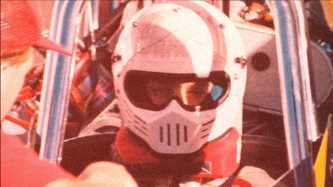 Biographical: After having been clocked at about 250 MPH, his parachute did not deploy and he crashed into the barriers at the end of the race track. His racing opponent thought that he may have been unconscious after finishing the run. Debris from his disintegrating car struck and killed two men in a support vehicle next to the end of the race track. Pieters was one of South Africa's best drag racing drivers. Full Name: Rocky Lee Powers, Sr.
Biographical: He died instantly when his motorcycle slammed into a car while traveling at about 100 MPH near the end of the 1/8th mile drag strip. He was from Beaufort County, South Carolina. He was survived by his wife. 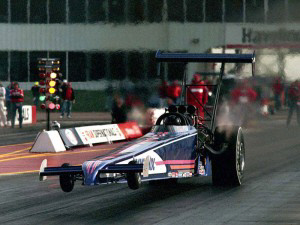 Biographical: He was making a time trial run when the engine of his dragster exploded. When oil from the blown engine got onto his rear wheels, he lost control of the car and smashed into a guard rail. He was taken to Ipswich General Hospital where he succumbed. 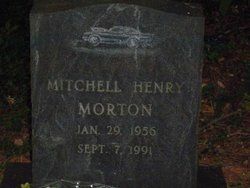 He was a resident of Hoxton Park, Australia, and had only been in drag racing for two years. He was partners with his father in the race car. Biographical: After crossing the finish line on the 1/8th-mile track, he crashed through an embankment and his car flew into the trees. He died two days later. 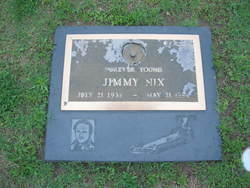 A resident of North Richland Hills, Texas, he was the second fatality at this race track in the space of three months. Full Name: James Buford Smith, Jr.
Biographical: He was in the left lane making a single run when his car suddenly veered to the right and slammed into a guard rail at the 1/8th mile drag strip. He was from Mount Holly, North Carolina. Full Name: William Ernest Staley, Jr.
Biographical: While making a qualifying run, he lost control at a speed of about 200 MPH. He barrel-rolled over the retaining wall and struck the base of a light pole. Unfortunately he had planned on that being his last race with the car. 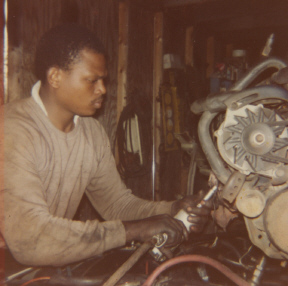 He lived and owned a high performance engine building business in Houston, Texas. He began racing in the 1960s and held national records in both AHRA and NHRA at various times and in various classes. 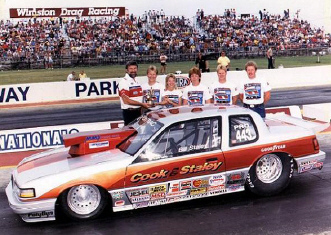 In 1986, his Pontiac Grand Am Pro Stock won the best engineered car award at the U.S. Nationals. He was survived by his parents, brother, sisters, and a son. Biographical: His car was a factory race car. The 428CJ was replaced with a 460 cubic inch 385 series motor that failed coming to the finish line. Some reportedly said he had a transmission failure. The car struck the opening of the guard rail. Cedar Falls has honored his memory with a memorial 1/8th-mile drag race each October. 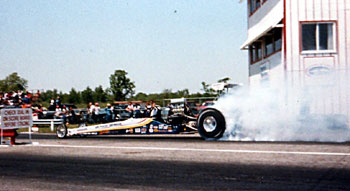 Biographical: A dragster driven by competitor Joyce Fitts went out of control and hit Tartaglia's dragster in the other lane. The collision sent his race car into the wall. He was transported to Exeter Hospital where he died later that evening. They were traveling at a speed of about 125 MPH at the time of the collision. He was a veteran of drag racing for twenty years. 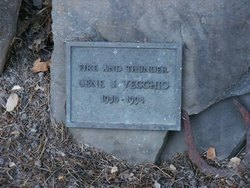 He lived in Tyngsboro, Massachusetts, with his wife, Patricia, and two children. He was an auto mechanic for a car dealership in Wakefield, Massachusetts. He had been diagnosed ten months before his fatal accident with Hodgkin's Disease, but chemotherapy treatments had put the disease into remission. Biographical: During the second round of qualifying in the Super Quick category, he was traveling at more than 100 MPH when his car veered into a guard rail halfway down the race track. He lived in St. Cloud, Florida, and died of massive injuries sustained in the accident. Biographical: After crossing the finish line at a speed of 115 MPH, his bike slid and flipped, resulting in his death. Biographical: He died upon impact when his car flew off the end of the race track at more than 200 MPH and collided with a tree. His parachute was not deployed and his brakes were not applied. Medical personnel speculated that he blacked out. Investigators determined that all safety equipment on the car was functioning properly. His career best time was 5.735 and 254.23 MPH on his J-34 Westinghouse-powered vehicle. He was from Novato, California, and was survived by his wife and two sons.